When the temperatures start to cool down and the leaves start to change color you may think that your foraging days are limited. That couldn’t be farther from the truth! Fall is actually quite the bounty for foragers and wildcrafters as it truly is the harvest season. 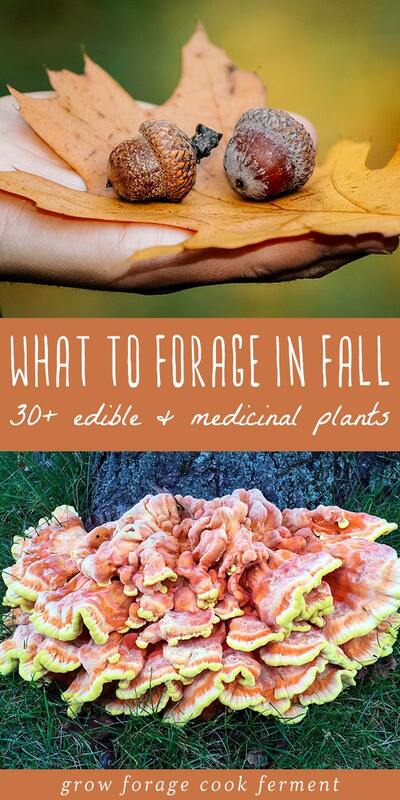 Here is a definitive guide for what to forage in fall! Read my other seasonal foraging guides here: What to Forage in Winter and What to Forage in Spring. One thing to consider when foraging in the fall, especially if you are in the harshest weather zones, is to leave much of what you may find for the wildlife. They are likely going to need it more than you will! 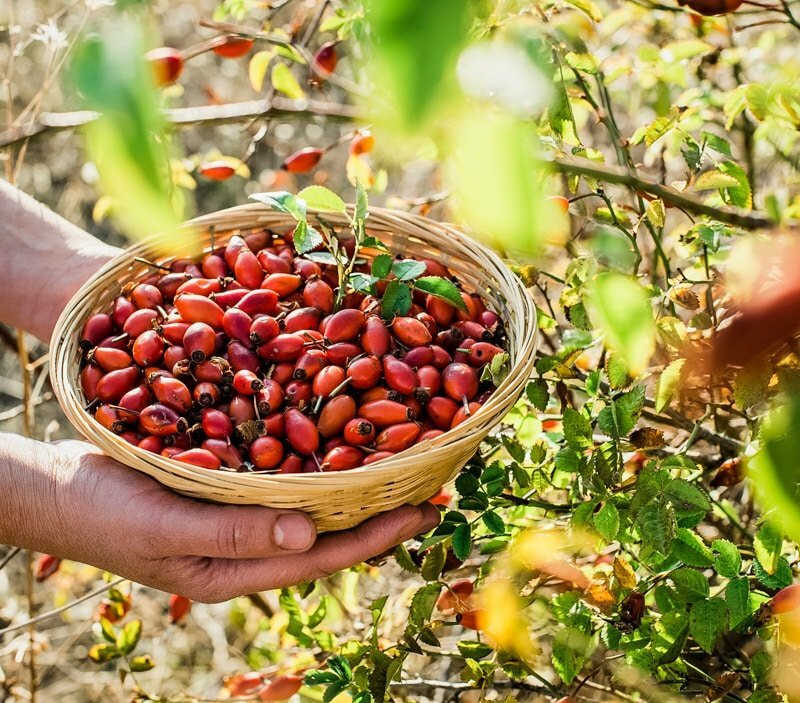 That’s not to say that you can’t enjoy a cup of pine needle or rose hip tea from time to time, but it’s good to be aware of the cycle of life and how we play a part in it. Fall really is the season of many wild fruits and berries. Wild versions of cultivated trees and plants like apples, grapes, and persimmons are plentiful in some areas. You may even be able to do a bit of gleaning this time of year if you live in areas that grow an abundance of fruit. 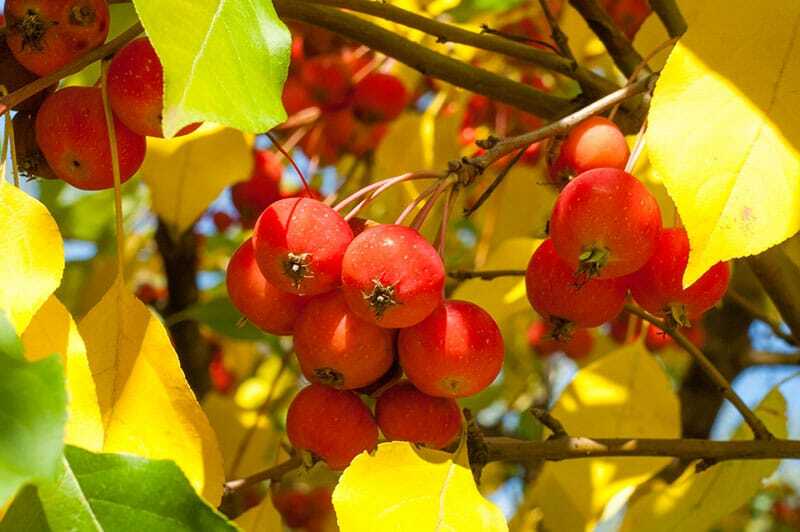 Crabapples – Wild apples are also known as crabapples, and they are smaller and much more sour than their cultivated counterparts. They are delicious when cooked into pies or other desserts and they make a great crabapple jelly or crabapple butter. Grapes – Wild grapes are common in many areas and grow along roadsides, forest edges, and stream banks. They are best after a frost, so fall is the perfect time for foraging. Use them like you would use regular grapes to make grape jelly, juice, or wine. Grape leaves are also edible. Persimmons – The American persimmon is native to the southeast part of the country and can be found wild there, along with California and a few other southwestern states. Persimmons are a delicious fruit that need to be eaten when very soft and ripe, otherwise they are extremely sour and bitter. Make persimmon cake or cookies with your foraged persimmons, or simply eat them as they are. Elderberries – Elderberries are popular right now because of their immense medicinal value. They are also edible, but are best cooked in order to avoid any stomach upset. They are easy to forage for in many parts of the world. 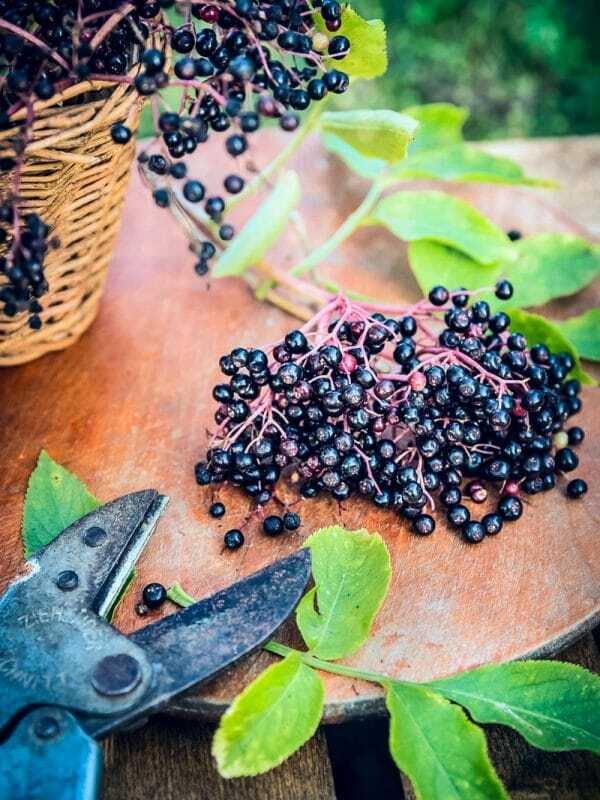 Make an immune boosting elderberry syrup, or try elderberry mead, soda, or fermented honey. They can also be included in a medicinal herbal tea blend. Autumn Olive – Autumn olives, also known as autumn berries, are not olives at all, but small red fruits that grow on a shrub. They have become an invasive species in the central and eastern United States. They are a tart berry that needs to be fully ripe before eating or else they are highly astringent. Use them to make jam, jelly, ketchup, or cookies. Cranberries – Wild cranberries are native to the Northeastern and upper Midwestern states and Eastern Canada, and are a popular berry for fall foraging. They handle frosts well and will last through the fall and sometimes even through part of winter. Use your foraged cranberries to make these awesome fermented honey cranberries. Rose Hips – Rose hips are the fruit of the rose flower, and can be found in the wild or in cultivation. They appear in the fall and in some regions will persist through part of the winter. They are high in vitamin C, and make a lovely tea, jelly, or syrup. I also like to use rose hips in a healing lip balm or salve. Sumac Berries – Sumac has a bad reputation for being poisonous, but only a few species are actually toxic. Any sumac variety that has red berries is edible, including staghorn sumac and smooth sumac. The berries grow in clusters and persist well into fall. They are very tart and make a wonderful sumac lemonade! Hawthorn Berries – There are many types of hawthorn berries, and they are ripe through the fall season. Not all varieties taste great, but none are poisonous, except for the seeds. Don’t eat the seeds! They are high in pectin and make a wonderful jelly or jam. They can also be made into syrup or this mead with rose hips. Most nuts and seeds are coming into their prime in autumn. They are a high calorie food that have historically been a staple in native peoples diets. Nuts and seeds are also an important food source for animals, so keep that in mind as you are harvesting. 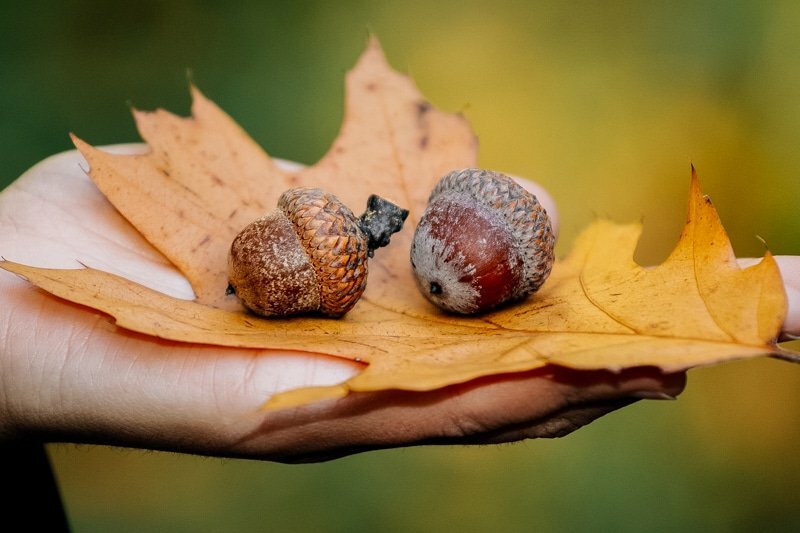 Acorns – The nuts of oak trees, acorns come into season in the fall (along with most other nuts) and are especially abundant. Acorns require a bit of processing first to make them edible, but the resulting flour is supposed to taste wonderful and can be used to make acorn cookies! Chestnuts – Sweet chestnuts are a classic and delicious fall treat, and are particularly good when roasted. Don’t confuse them with toxic and very bitter horse chestnuts though, they look similar to the untrained eye. Black Walnuts – Black walnuts are abundant in many areas and are a perfect fall foraging food, but they take a bit of work to hull and crack. Some people aren’t crazy about the flavor, but give them a try and see what you think! Make black walnut pie or black walnut snowball cookies with your foraged black walnuts. Pine Nuts – Pine nuts come from the piñon pine which grows in the western United States. They ripen in the fall and like most wild nuts are a bit difficult to harvest and process, but that doesn’t make them any less delicious! Use your foraged pine nuts to make pine nut ice cream or pine nut cookies. Dock Seeds – Curly dock and yellow dock are common leafy weeds that are foraged in spring and summer for their greens. In late summer they shoot up a large stalk that will eventually be covered in seeds in fall. Once winter comes, the plant will die back, leaving the dried seed stalk. I’ve heard it’s difficult to collect the seeds and do much with them, but these recipes for dock seed crackers and dock seed brownies sound pretty tasty! Roots and tubers are best harvested in the fall because that is when they have the most vitamins and minerals. They also taste best after a frost which brings out their sugars and makes them sweeter. 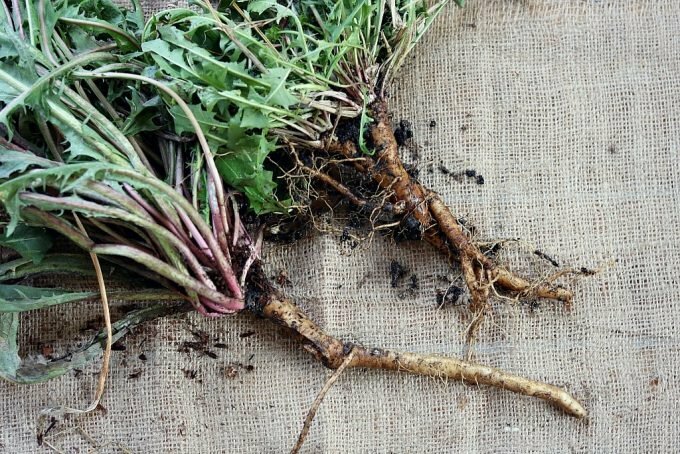 Dandelion Root – Dandelion root is abundant and perfect for fall foraging. It is a highly medicinal bitter herb that can be used to make a caffeine free coffee substitute, chai, or even an infused honey. It is also a great herb to use in homemade bitters. This dandelion root coffee cake sounds amazing! Chicory Root – Chicory grows almost everywhere and the root can be harvested through the fall. Like dandelion root, it is another bitter herb that makes a nice coffee substitute if you’re in need of a hot drink, and this chicory mocha looks delicious. If you find both dandelion and chicory root you can make this dandelion and chicory chai. Burdock Root – Burdock is a thistle that has a edible and tasty root. In fact, there are many types of thistles such as bull thistle and milk thistle, that have edible roots that you might be able to dig up during the fall season. 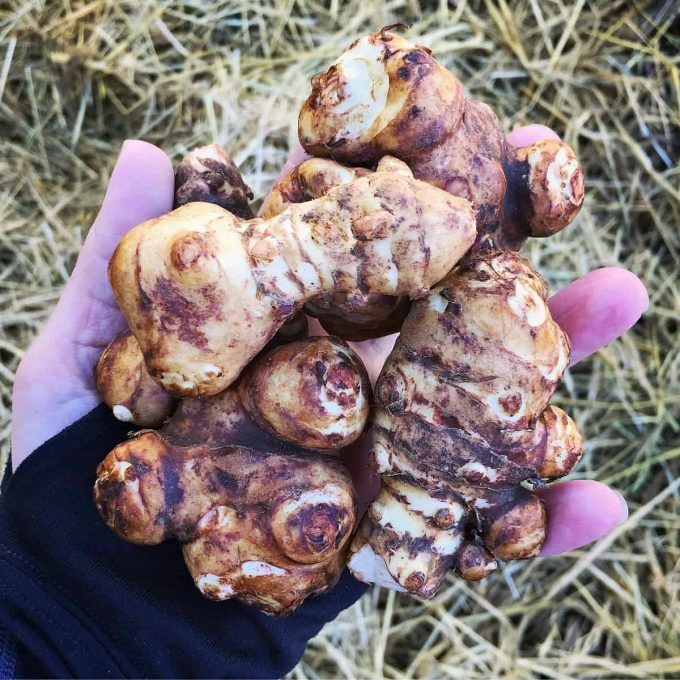 Jerusalem Artichoke – These knobby tubers actually get sweeter and more digestible after a couple of fall frosts. They are most often grown in gardens, but also naturalize very easily and can also be found growing in disturbed areas. Try them in this hunter’s pie recipe. 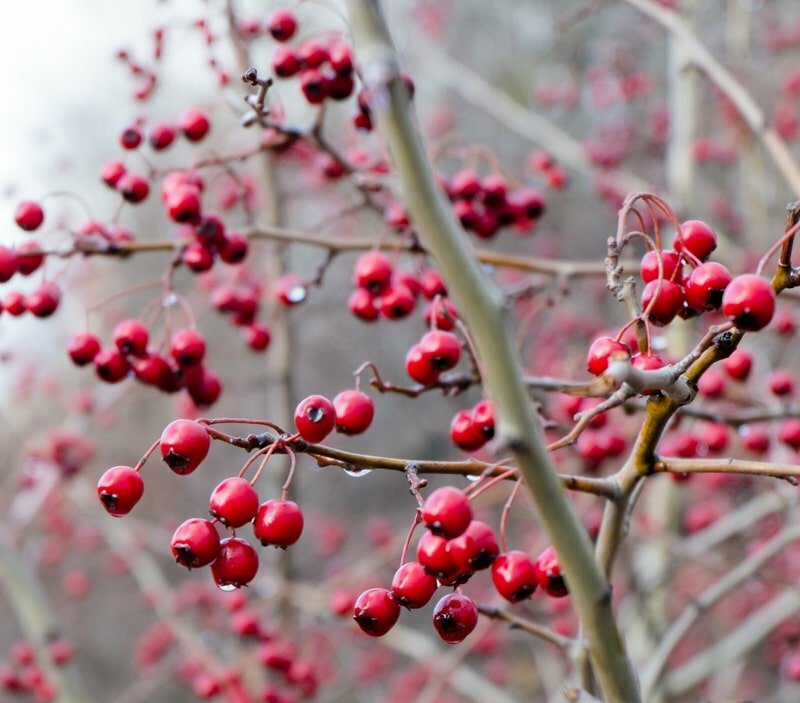 Fall and winter are a great time to forage for trees. Because they are perennial they are always there and the needles, cones, and bark can provide us with seasonal wildcrafting. Conifer Needles – The needles of evergreen conifers are one of the easiest and most widespread things to forage in the fall. Most conifers are edible, with the exception of the yew tree, which is toxic. Try pine, spruce, fir, redwood, or hemlock (the conifer, not the toxic herbaceous annual plant). 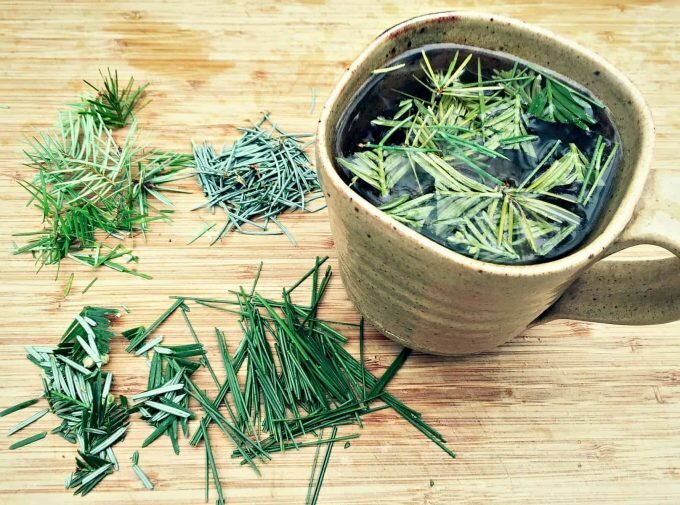 Conifer needles make a lovely tea, or you can even put them in cookies or boozy infusions. 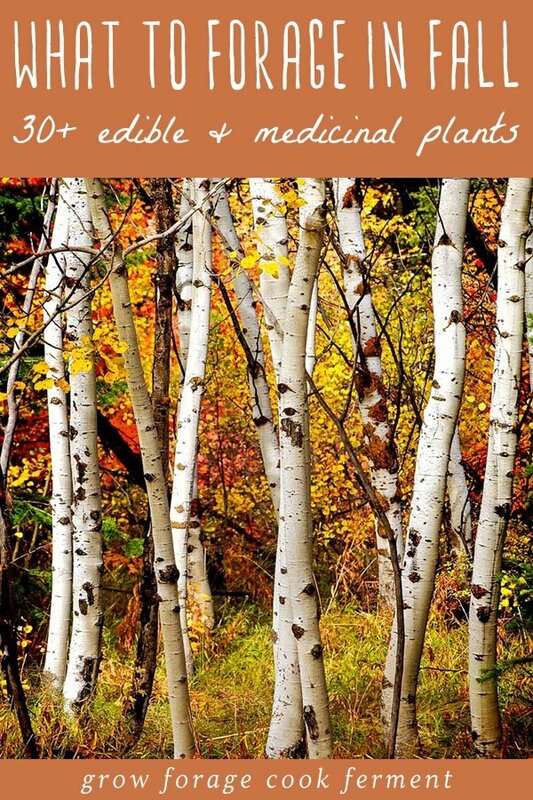 Birch Bark – Birch trees are another one that can be foraged in colder regions. The bark and small twigs and branches can be made into a tea. The inner bark can also be made into a flour substitute. Don’t take too much of the bark from one tree as it can be harmful to the growth of the tree. Sassafras – Sassafras root and bark can be used to make tea and is one of the original flavorings for root beer. It grows in the eastern half of the United States and can be quite prolific in some areas. A good way to identify it is by its distinctive mitten shaped leaves. Juniper Berries – Juniper berries aren’t really berries at all, they are actually a fleshy pine cone with a distinctive scent and flavor. They are most commonly used as a spice or for medicinal uses rather than as food. They are probably most well known as the main flavoring agent for gin. Collect some and make your own infused winter gin! They can also be made into a medicinal tea, or used to make a wild yeast starter for fermenting. I even used them in one of my famous beard balm recipes! Many spring leaves and flowers will make another appearance in the fall, and a few summer flowers will persist into fall. The fresh greens and colorful flowers are a welcome sight after a hot and dry summer. Dandelion – We already talked about dandelion root, but it’s common for dandelion greens and flowers to come back to life after the first fall rains. They will die back after a frost or two, so enjoy them while you can! I like to make dandelion pesto with the greens, or if you get a lot of blossoms you can make dandelion salve. Chickweed – Chickweed is one of my very favorite wild greens. It is one of the first edible greens to come up in the spring, and then like magic it makes another appearance in the fall after it cools down a bit and we get some rain. I love making chickweed pesto with its prolific greens! You can also freeze chickweed for later use. Violet – Wild violet is just like chickweed in that it comes up very early in the spring and then again in the fall. It is even a bit more frost hardy than other spring and fall greens, often persisting through several frosts and even some light snow! It’s such a lovely sight to see those purple flowers again, and making a batch of violet vinegar is usually on the agenda. The leaves can be made into a healing cough syrup with honey. Plantain – Plantain usually hangs on throughout the hot summer, but it appreciates the rain that fall brings and will get more green and lush. While plantain has edible leaves, it is mostly known for its medicinal properties. It is awesome for helping to heal skin rashes and minor wounds. Yarrow – Like plantain, yarrow also survives through the summer heat, but regains new life in the fall. Even in somewhat cold climates yarrow can survive through most of the fall and sometimes even into winter. It is a bitter herb that is good for stopping bleeding and reducing fevers. Goldenrod – Goldenrod has a lovely yellow flower that is often wrongly blamed for allergies when ragweed is usually the main culprit. It blooms in the late summer and into fall. Use goldenrod to make an herbal honey or tincture, or make goldenrod soap! Fall is the perfect time to forage for fungi, especially after the first few rains of the season. There are a few species of tasty edible mushrooms that are prevalent in the fall. Chanterelle Mushrooms – I think that chanterelle mushrooms are probably my favorite mushrooms to forage because they are so delicious. They are most prevalent in the fall after a few good rains. You can’t beat fresh chanterelles sauteed in butter with a little garlic and thyme. Or if you’re a little more adventurous you can try chanterelle ice cream! 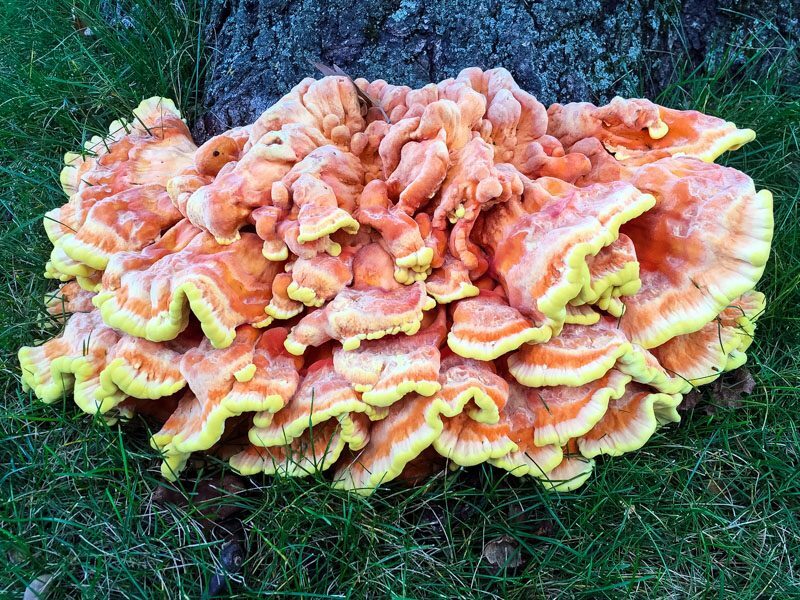 Chicken of the Woods – I have never had the opportunity to forage for chicken of the woods, sometimes simply called chicken mushrooms, because they don’t grow in my region. They are quite common in many areas, however, and are one of the easier edible mushrooms to identify. Here are a whole bunch of great chicken mushroom recipes! Maitake (Hen of the Woods) – I would love to someday find some maitake mushrooms, as they are one of the tastiest around! They are abundant for just a short time in the fall, exactly when depends on a number of factors, so it is easy to miss them. This maitake mushroom jerky sounds interesting! Oyster Mushrooms – Oyster mushrooms grow on downed logs or standing dead wood, and can often be found year round. They won’t tolerate a hard freeze, but I often find them in the fall and sometimes even into winter. Oyster mushrooms are delicious and one of my favorites to forage! Shaggy Mane Mushrooms – Shaggy mane mushrooms are widespread and easy to find, often popping up in lawns or parks. They come up in the fall after the rain comes. They are easy to identify and have no poisonous look-alikes, making them a good choice for beginning mushroom foragers. There you have it, over 30 fruits, berries, nuts, seeds, roots, tubers, leaves, flowers, and mushrooms to forage in the fall!